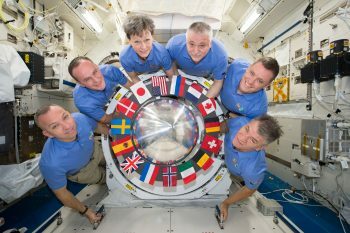 This weekend ESA astronaut Paolo Nespoli will say farewell to three of his crewmates who will leave the International Space Station back for Earth. Fyodor is the current commander of the Space Station so he will hand over duties to NASA astronaut Randy Bresnik on Friday 1 September at 20:30 CEST in a formal ceremony that will be broadcast live via NASA television. This ceremony will mark the end of Expedition 52. The flight home for the trio will leave late at night European time with Peggy, Fyodor and Jack saying goodbye at 20:00 CEST and closing the hatch between Soyuz MS-04 and the Space Station at around 20:40 CEST. Paolo will stay in space with Randy and Roscosmos astronaut Sergei Ryazansky looking after the Space Station and continuing their science duties. The next trio to visit are already gearing up for launch on 12 September. NASA astronauts Mark Vande Hei and Joe Acaba will join Russian commander Alexander Misurkin in their Soyuz MS-06. More on the launch in a later blog post. Good return to them home to the trio e good luck to next trio.